The story is set in the Wild West of post war Iraq. A group of Iraqis are offering for sale a highly valuable painting. It is Vincent Van Gogh's still life - Vase with Irises on an Orange Background. The painting was originally stolen from Kuwait by Iraqi forces during the First Gulf War. In the chaos that engulfed Baghdad during the recent conflict Saddam's palaces were looted and the Van Gogh fell into Iraqi hands. HMG are seeking to return the painting to its original owner, a Kuwaiti Prince, to thank him for his support during the recent Iraq conflict. But rather than paying, the British Government decides to launch a black operation to forcibly retrieve the painting. Or at least this is the story told to ex-SAS soldier Mick Kilbride when he is recruited to lead a team to seize the painting. 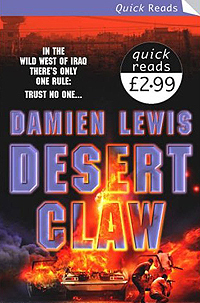 Mick's mission is given the code name Desert Claw. He and his men are on a black, deniable operation. If they are captured or killed in Iraq they will be disowned by HMG. Mat and his right hand man, SAS tough man 'East End' Eddie, are told to leave no man alive. There are to be no witnesses to their mission. They are provided with the nerve agent gas Sarin to kill the Iraqis without harming the painting. But as Mat and his team are drawn into a web of violent action and intrigue in Iraq, it becomes increasingly clear that there is a hidden agenda to the mission. Only the involvement of American Iraqi war veteran Bill 'Bronco' Berger saves the men from certain death in a bloody ambush. In the climactic scenes Mat and his team are confronted by the British officer who first recruited them - and they realise that they have been horribly betrayed. But the denouement introduces a shocking twist to the tale as they turn the tables on their betrayers. The story is darkly disturbing. It is also unsettlingly close to the reality of post-conflict Iraq, where fortunes are being made and lost overnight .. and good men are dying in the process. From the cover of the bushes Mick stared at the target building with unblinking eyes. It was barely thirty yards away. Their approach across the desert had been slow but sure and no one had noticed their passing. In spite of the chill desert night, it was hot and sticky inside the bulky suit and he could feel the drops of sweat trickling down his neck. He wiped the eye-piece of his night vision unit. Four windows were lit up in the target building. Every now and then he could see a figure flit across one of them. People were awake and active in there, but that was as he had expected. Everything seemed quite normal. Mick scanned the building’s perimeter. To one side there were a couple of pick-up trucks parked up, but they were deserted. He moved his night vision unit up to inspect the top of the building. It had a flat roof, and that was one thing he hadn’t been briefed on. If it had a flat roof there could be men up there. There could be guards. It was the obvious place to keep watch from. He scanned the top of the building carefully. The eerie green glow of the night vision unit showed up the flat roof clearly. For a full minute he kept his eyes on that part of the target. But there was no movement and it looked to be deserted up there. Above the flat roof it was a brilliant, starry night. There was far too much moonlight for Mick’s liking. But there was bugger all he could do about that. It was time to start the attack. Silently, he signalled for Fire Team Three to advance to the power line. With his heart in his mouth, he watched their hunched figures flit through the darkness. Barely thirty seconds later there were three red flashes coming out of the night. They were signalling they were in position and ready. Mick thanked his lucky stars that Bill was on the team. Fire Team Three were using one of Bill’s special gadgets to cut the power to the target. It would send a massive electric surge through the line into the building and blow all the fuses and light bulbs. Even if the terrorists had a back-up generator, it wouldn’t be of any use, as the whole electrical circuitry of the building would be fried. Mick glanced across at Eddie, Kiwi Jim and Jock. He placed the palm of his hand on top of his head. It was a sign that meant ‘on me’. Then he turned and headed towards the front of the building at a crouching run. His heart pounded in his head. If there was one moment when the mission was most likely to be blown, this was it. He rounded the corner and flattened himself against the wall, to one side of the front door. A split second later Eddie was at his shoulder. Then the Kiwi and Jock appeared on the far side of the doorway. Quick as a flash Mick whipped out a Sarin canister from his chest webbing. At the same time, Eddie unhooked an axe from his belt. Mick looked across at the Kiwi and Jock. The Kiwi gave him the thumbs up. They, too, were ready. Mick glanced down at the Sarin canister. He grabbed the pin holding the retainer clip. It glinted in the light from the window. Once he pulled it the canister was primed to pump out its deadly gas cloud. This was the point of no return. Gently, he eased the pin free. Only his hand was holding the retainer clip now. Once he released his grip, the clip would fly free. Then there were five seconds before the gas would start pumping. He pressed the ‘send’ button on his personal radio. The radio pick-up was pressed against his neck. It was so sensitive it would transmit even the faintest voice message. ‘Alpha One, ready,’ Mick whispered into it. ‘Alpha Two, ready,’ came the whispered reply from Bill. ‘Alpha Three, ready,’ came Guy’s reply. A split second later there was a fizzing and a popping of light bulbs inside the house. Then the whole building went black. At exactly that moment Eddie swung the axe through the window. The noise of breaking glass was covered by Arabic cursing, as the men inside crashed about in the darkness. Mick heaved the Sarin canister in through the broken window. He began counting, silently, in his head. One. Two. Three . . . As he did so, he grabbed his gas mask off his belt and pulled it over his head. He covered the filter with his hand, and took a sharp intake of breath. It sucked the mask tight against his face, proving that it made an airtight seal. He pulled on his thick gloves and continued counting. Ten. Eleven. Twelve. He could hear a faint hissing from inside the building, as the canisters released their deadly gas. And then there was a gasping and choking from inside the room. Bodies smashed into furniture. Mick heard a man vomiting violently. Another thrashing about as he struggled to breathe. Another’s strangled screams as the gas took hold. Seventeen. Eighteen. Nineteen, Mick counted. Twenty! Mick smashed his boot into the front door with all his strength. The cheap wood splintered and then he was kicking his way into the dark interior. He had his MP5 machine-gun at the shoulder. Using the torch attached to his weapon he swept the room with a beam of light. The air was thick with an oily, white gas that danced in the light. Bodies writhed on the floor in front of him, clawing at the floor. No one noticed him. No one cared. Their eyes were blinded by the searing gas. They were dying. Mick jumped over a figure heaving and vomiting on the floor in front of him. Two quick strides and he was at the rear of the room. The stairs lay up ahead. Instantly, Eddie was at his shoulder, the Kiwi and Jock on the far side of the stairwell. Mick paused as he and Jock grabbed a Sarin canister each. They pulled the pin and held down the retainer clip. Mick signalled to Eddie and the Kiwi to hit the darkened stairs. The two men pounded up the wooden staircase, sweeping the area above with their weapons. Mick and Jock followed, right on their heels. They could have done this with their eyes closed. Back at Bill’s villa they had memorised every detail of the building’s layout. Two doors lay off the top of the staircase, one to the front and one to the rear. Mick let the retainer clip fly on the Sarin canister. And then Eddie hit the first door, his boot crashing into the wood. The second he did so Mick tossed the Sarin inside. A ghostly figure appeared at the dark doorway, cursing in Arabic. He raised an AK47. But as he did so, Eddie fired. Thwoop! Thwoop! Thwoop! Three silenced bullets at point-blank range from his MP5. For a split second the young Iraqi’s eyes bulged outwards. Then his face caved in where Eddie had shot him, and he keeled over and hit the floor. A horrible choking and gasping came from the room behind him. Mick knew that the gas would deal with the others. Clearing floor three was their priority now, and getting their hands on that painting. It was up there somewhere, and Mick needed it intact and undamaged. The four men paused for a second at the bottom of the stairs. Mick and Jock each grabbed another Sarin canister. On Mick’s signal they hurled them up the stairwell, into the hallway above. He didn’t want any shooting up there, as he couldn’t risk damaging the painting. He was going to use Sarin overkill instead. He grabbed another Sarin canister, and they crept up the stairs. At the top there was still no sign of the enemy. In a repeat of the attack on the floor below they hurled canisters into the rooms, but still there was no sign of anyone. ‘I can’t see an effin thing with all the gas,’ Eddie yelled. ‘Got to search the place,’ Mick yelled back. Covering each other, Mick and Eddie moved through the front room. Kiwi Jim and Jock were doing the same at the rear. But still they could find no Iraqis. Then Mick heard a faint burst of static on his radio, which meant he was getting a call from one of his men. Mick and Eddie hurried across to the back room. Kiwi Jim and Jock signalled them over to one corner. A flight of metal steps led up to the roof. A trap door in the ceiling was open. Through it Mick could see the starlit sky. Clearly, the metal steps would only take one man at a time. Mick glanced around at the other three men. “Volunteers?” he asked with a grin. “I’m right behind you, mate,” Kiwi Jim replied. Before Mick could stop him the big Scot put his foot on the steps and started climbing. As his head neared the top he switched off the torch beam on his MP5. He reckoned there was enough moonlight up there to see and kill by. The torch beam would simply make him an easy target. He brought the weapon to his shoulder. With one hand he held onto the steps and with the other he kept his gun aimed. Slowly he crept up the last few steps, Kiwi Jim joining him below. As Jock’s head emerged from the trap door on the roof he tried to stay as light on his feet as possible. He was already searching for the enemy. He scanned the roof. There was not a lot of cover. A pile of wood to his left and an old bicycle leaning against it. Lines of washing right in front of him. Some oil drums off to the right. With just his head and shoulders above the roofline Jock kept scanning for the enemy. They had to be up here somewhere, he just knew it. For several seconds he stayed like that, silently listening out and watching. Finally, Jock placed one hand on the deck and vaulted onto the roof. As he rolled away from the trap door, he heard a crash. One of the oil drums had gone over. A moment later there was a deafening burst of gunfire. Jock came to his feet in a crouch, his weapon at the aim. Bullets were tearing all around him and ricocheting off the roof. Instantly he sighted on the muzzle flash, just above the oil drums. He squeezed off three silent rounds. A double tap. Two to the body to drop him. One to the head to make sure he was dead. In this game it was about being first on the draw with accurate fire. The Iraqi’s had been way off the mark. Jock changed position now, then scanned all around him. Kiwi Jim vaulted out beside him. He was quickly followed by Mick and Eddie. Jock and Kiwi Jim took the right side of the roof, Mick and Eddie the left. As Jock advanced he kept his eyes on the oil drums up ahead. There were more of the enemy behind them, he just knew it. Suddenly, a figure broke cover and made a run for it. Instantly, Jock had him in his sights. It was a young Iraqi, no more than sixteen years old. He had an AK47 clutched in one hand. Within seconds, the young Iraqi was cornered on the edge of the roof. Jock advanced slowly towards him, keeping him covered as he did so. The Iraqi took a fearful step backwards. Jock’s bulky suit, gloves and mask made him look twice as large as normal and he towered over the young man. The Iraqi jerked his head from Jock to Kiwi Jim and back again. He took another step backwards, his AK47 dangling in his hand. The edge of the roof was now right behind him. He had nowhere to retreat to. “Drop the gun!” Jock growled. Suddenly, there was a horrible cry. The terrified Iraqi had taken another step backwards and disappeared from view. Jock took a quick stride to the edge of the roof and peered over. Spread-eagled below him was the young Iraqi’s body. He’d fallen onto the back of one of the pick-ups parked below. He was lying perfectly still, but at an odd, unnatural angle. It looked to Jock as if he had broken his neck. No doubt about it, he was dead. “Thank fook for that,” Jock muttered, as he turned away. The Major had ordered that they take no prisoners. At least it meant that Jock didn’t have to shoot him. “All clear on the roof, I reckon,” the Kiwi announced via the radio net. “You got it,” Mick replied. “Let’s go find the effing painting,” Eddie added. Together with Kiwi Jim, Jock strode back across the roof to join Mick and Eddie. But as he did so he caught a shadowy shape out of the corner of his eye. There, hidden among the washing, an Iraqi was raising his weapon. They had missed one of the bastards. Jock swivelled with his gun and squeezed the trigger. But the noise of his silenced weapon was drowned out by the bark of the Iraqi’s AK47. There was a flash of muzzle flame as the enemy fired off a wild burst. Then he keeled over, his weapon still firing on automatic. Jock followed him down with his gun sight. The Iraqi lay still on the roof, his body tangled in the washing. Jock could see a pool of blood staining the sheets a deep red. As Jock allowed himself to relax a little he felt a sharp pain in his jaw. He must have been hit. He lifted his hand to check, but could feel nothing through his heavy gloves. He shone his torch beam on his glove. There was a small patch of blood. It couldn’t be anything serious, Jock told himself. Most likely a flesh wound from one of the stray AK47 rounds. He’d deal with it later, once the mission was over. It had to be nearing its end. Jock turned to the others and the four men headed back towards the trapdoor. As they hurried down Jock was the last to leave. He checked the roof one last time, just to be sure. Then he took a few steps down into the gas-filled interior. As he did so, the Sarin swirled around his knees. It was still thick like a fog in there. A second later the gas was over his head. Suddenly, Jock took a choking, burning gasp. He felt his windpipe clamp shut, as he was hit by a wave of searing pain. He couldn’t breathe! He couldn’t breathe! He clutched in panic at his throat, unable to comprehend what was happening. Then the nausea swept over him and he collapsed, his body crashing down the metal steps. Jock landed in a heap on the floor. With the last of his energy he punched the send button of his radio. But he was incapable of speaking. All that came out was a choking, rasping series of gasps.